For nearly two hundred years, a fragment of the journal of John Maley, an obscure explorer on the American frontier, resided at Yale University and was treated with some skepticism by historians. It was only in 2012, when the first half of the manuscript turned up at a barn sale in Pennsylvania and was acquired by Southern Methodist University's DeGolyer Library, that the full story of Maley's travels could be pieced together. Wanderer on the American Frontier makes the complete journal available for the first time, allowing readers to follow a contemporary of Lewis and Clark on his journey through the Ohio, Mississippi, and Red River valleys, and to reassess the account's authenticity. Between 1808 and 1813, Maley covered more than 16,000 miles through thirteen present-day states. Much of that travel took him beyond the fringes of civilization, and his journal offers some of the earliest descriptions of the Ozark Plateau, the Ouachita Mountains, and the upper reaches of the Red River. His account also provides a firsthand look at life on the frontier in the tumultuous years following the Louisiana Purchase. 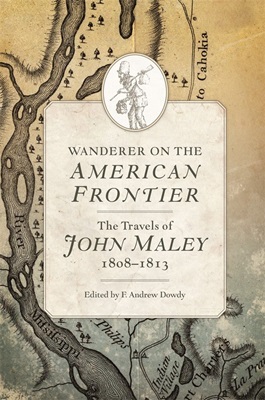 Editor F. Andrew Dowdy has carefully retraced Maley's steps and, with extensive use of maps, has reconciled some of the journal's more confusing passages to give readers clear modern-day reference points. Numerous annotations and appendices provide necessary historical context, from the link between Maley's 1809 Indiana copper exploration and the Treaty of Fort Wayne, to the ways his 1811 foray into Spanish Texas presaged further filibusters there during the Mexican War for Independence. The fascinating tale of one of the wider-ranging explorers in American history, Wanderer on the American Frontier is an invaluable resource that provides a unique window on the West in the early nineteenth century. F. Andrew Dowdy is a retired geological engineer and U.S. Foreign Service officer. As an independent historian he researches North American colonial history, pre-Columbian cultures, and early mineral exploration. To register, call 214-768-3684 or email swcenter@smu.edu.